If you value this project, please think about supporting it by becoming a Patreon patron or via a one-time PayPal donation. Thanks! If you are interested in the history of digital culture and interactive entertainment, visit my other site, The Digital Antiquarian. The last decade of the 18th century was the most tumultuous in the political history of France, a country whose politics have often been defined by their tumultuousness. A revolution that had been born in 1789 out of the new Enlightenment ideals of democracy, equality, and fundamental human rights collapsed over the years that followed into the spasms of senseless killing that became known as the Reign of Terror. When a “Directory” of five men who were distinguished only by their corruption took power in 1795, an exhausted country was willing to accept this pale shadow of the revolutionary ideal if it would stop the ceaseless chattering of Madame La Guillotine. Even as France was bleeding internally, it was threatened externally by a series of shifting coalitions encompassing much of Europe. The country’s many opponents were doubtless motivated partly by real concern about the atrocities taking place there, but at least equally by worries over where these new ideas about liberty and equality — however much the Reign of Terror had made a mockery of them — might lead if allowed to spread to their own populaces. Certain it was about to be attacked, France in early 1792 declared preemptive war against Prussia and Austria, touching off what would turn into 23 years of more of less constant conflict between it and the rest of Europe. These wars would long outlive even the most facile commitment to democracy in France. It was a strange thing. Given the political, economic, and social chaos inside the country, not to mention its utter strategic isolation, France ought to have been an easy nut to crack. Instead it proved unexpectedly clever and resilient, adept at keeping its enemies off-balance and holding the fighting well away from its own borders. Try as it might, the rest of Europe could never quite land the knockout punch. In the midst of feuding and killing one another at home, the French cheered the successes of their military abroad. Their greatest hero was undoubtedly Napoléon Bonaparte, an absurdly young Corsican general who in 1796 and 1797 led an army across Italy and almost to the gates of Vienna, forcing the Austrians to sue for peace and bringing an end to the so-called War of the First Coalition. As he returned to Paris in triumph, the French people already felt no need to refer to him by his last name. He was simply Napoleon, their savior. Napoleon didn’t cut a very impressive figure in person. He was a scrawny 5 feet 3 inches (1.6 meters) tall. His stringy hair framed an unmemorable face, and he spoke French rather badly, with a heavy Corsican accent. Yet this 28-year-old former artillery officer from an undistinguished lineage had reservoirs of self-belief that would smack of delusion absent his uncanny knack for wrenching so many of his narcissistic schemes into reality. His career was already a highly unlikely one, but he was only getting started. Drunk on personal glory and the people’s adulation, he went before the Directory and proposed leading an invasion of Egypt. 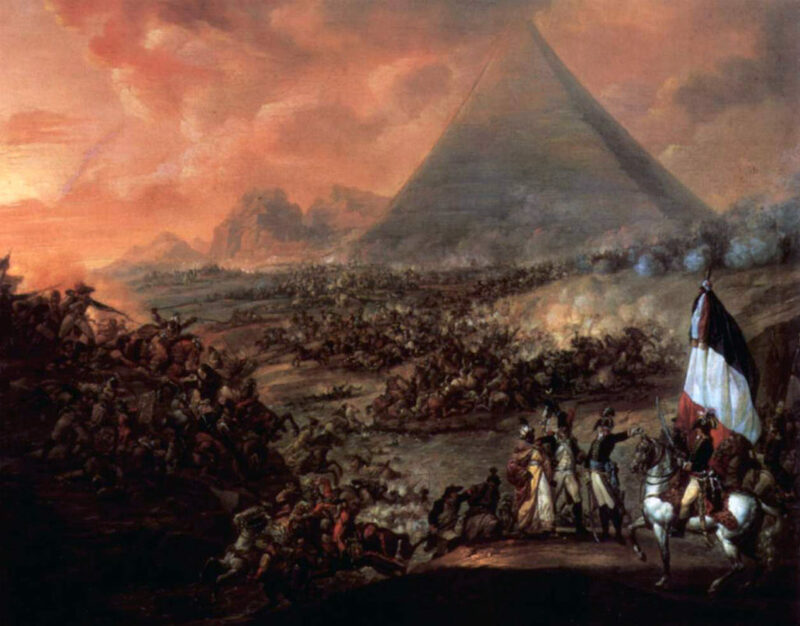 Napoleon argued that this bold gambit would put a stick in the eye of the nation that now, after the defeat of the Austrians, seemed the biggest threat to France: Great Britain, who had significant trading interests in and around Egypt. If all went well, Napoleon said, he could use an occupied Egypt as a springboard toward the Far East. Eventually he could advance all the way to India, the jewel of the British Empire, and make it too a French possession. That was the strategic argument, which was certainly grandiose enough. But Napoleon had other, only slightly more private motivations. A dedicated student of classical history, he dreamed of duplicating the feats of Alexander the Great, the most legendary ancient conqueror of all; he too had conquered Egypt (then a part of the Persian Empire) and pushed east as far as India. Like Alexander, the civilizing conqueror, Napoleon’s project would encompass more than military dominion. He would bring the fruits of the Enlightenment to the benighted peoples of the East. “The real conquests,” he said, “those that leave behind no regrets, are over ignorance.” He already had imperial dreams. Perhaps he would be able to set himself up as truly the next Alexander, ruling over a vast empire, owing little if any allegiance to the powers that were in France. This part of his idea, of course, he neglected to tell the Directory. Egypt at the time was nominally a part of the Ottoman Empire, but was ruled in practice, as it had been for five and a half centuries, by a strange warrior caste known as the Mamelukes. Apparently Turkish in origin, they had been the scourge of the Crusaders; stories of their fierce cruelty and fanatical bravery in battle were still told around many a soldiers’ campfire in Europe. Tiny in number in comparison to the population they ruled with an iron fist, they hewed to a strict policy of racial segregation, importing light-skinned youths from the Caucasus region when necessary to augment their ranks. Whatever their fearsome reputation, Napoleon and even the Directory believed, with some justification, that the Mamelukes wouldn’t pose a serious threat to a modern French army. The more pressing question was that of the Ottomans’ reaction to this unprovoked invasion of what was, however nominally, a part of their sovereign territory. On the other hand, the Directory could certainly see the utility in getting Napoleon, their crazily ambitious young agitator of a military hero, out of what was still a very unstable France. And the country’s wily foreign minister, Charles-Maurice de Talleyrand-Périgord, said he would be willing to travel to Constantinople shortly after the invasion and smooth over any ruffled feathers there. So, the Directory agreed to a constrained version of Napoleon’s plan. He could have 25,000 soldiers — less than half what he had requested — and a fleet of ships to carry them to Egypt, provided that he paid for it all himself. This he did, by dispatching his lieutenants to loot the treasuries of the territories he had recently conquered. But Napoleon wanted more than ships and soldiers. In keeping with his dream of becoming the next Alexander the Great, he wanted great minds with which to civilize and educate the conquered populace. He put one of his most trusted generals in charge of recruiting intellectuals — what Napoleon called his “savants” — to join a grand expedition of uncertain duration to a foreign land; the potential recruits weren’t told precisely where. In a testimony both to Napoleon’s status and to the lingering danger of being an accomplished person of any sort inside France, an extraordinary number of them agreed to sign on. Napoleon wound up recruiting 167 savants in all, some of them youngsters trying to make a name for themselves, others among the most respected men of learning in the country. The role call contained names which still appear today in histories of science, mathematics, and engineering, such as Joseph Fourier (the discoverer of the greenhouse effect), Nicolas Contê (the inventor of the modern pencil), and Gaspard Monge (the inventor of descriptive and differential geometry). For all the dazzling intellectual virtuosity on display among the savants, none of them was recruited with the specific intention of studying the remains of ancient Egypt. This isn’t surprising in itself; the field of archaeology simply didn’t exist yet, and no one among the savants knew for sure where they were going anyway. That said, classical Greek and Roman texts, some of them touching upon ancient Egypt, were still considered an essential part of any educational curriculum. This applied to the engineering program at the Paris Schools, where an energetic 21-year-old savant named Edme-François Jomard had studied, just as it did everywhere else. Jomard would become one of the two most important proto-archaelogists on the expedition. The ragtag fleet which sailed from Toulon on May 19, 1798, was some combination of invasion force, gypsy caravan, and traveling cultural exhibition. It included no less than 335 ships of all types and sizes, carrying 1200 horses, 171 artillery pieces, almost 40,000 soldiers (Napoleon had cheated a bit in regard to the Directory’s restrictions), and of course the 167 savants. Some 300 women were also aboard — wives, mistresses, washerwomen, seamstresses — as were a hot-air balloon, an array of cutting-edge scientific equipment, several printing presses, and a library of over 500 books. Every evening, Napoleon would conduct a salon aboard his flagship, the appropriately named L’Orient. He would pose a thorny question to his favorite savants — “Is there life on other planets?”; “How old is the earth?” — then sit back with a proprietorial smile on his face as they thrashed it out. The clumsy fleet meandered along, stopping off at the island of Malta for a quick bit of conquering by way of a warmup. They were very, very lucky. The British admiral Horatio Nelson was aware that a major fleet had sailed from Toulon, and was scouring the Mediterranean for it. His lookouts actually sighted the outer vanguard of his quarry at one point, but, having been misinformed about the exact date of the French fleet’s departure from Malta, he concluded based on their location that the ships in question couldn’t be the ones he sought. Landings began on July 1, just outside of Alexandria. The fabled ancient city was little more than a ruin in 1798, its population not 10 percent what it had once been. Its strategic importance as well was minuscule compared to the more active ports of Rosetta and Damietta, but the symbolism of beginning in the city of Alexander the Great was irresistible to Napoleon. After securing Alexandria, encountering only a few scattered tribes of Bedouin nomads by way of opposition, the main body of Napoleon’s force set off toward Cairo. The march was a miserable affair. The soldiers were largely dressed in woolen uniforms suitable for campaigning in Europe, but markedly ill-suited for life under the brutal desert sun of high summer. To save time, the army marched overland rather than following the contours of the Nile Delta’s many branches. When they occasionally came into contact with water, the suffering men threw themselves into it bodily, as they did upon the unlucky villages they chanced to encounter. The army was constantly harassed by Bedouin bands nipping at their flanks, but far more soldiers died of thirst than were killed by such attackers. Others reportedly shot or drowned themselves to escape the agony of the march. The Egypt through which they traveled was in many ways less advanced than it had been during the time of the pharaohs. Irrigation, the lifeblood of this arid country, had regressed over the centuries of Mameluke rule, spawning famine and disease, and a once-vibrant culture had ebbed along with the precious water into poverty and illiteracy. Cairo, one of the world’s greatest seats of learning at the time of the Crusades, was a shadow of its old self, its universities either abandoned or turned into instruments of fundamentalist religious indoctrination. Cairo, and by extension all of Egypt, was ruled by two Mameluke beys, or clan governors, working in a tense partnership. Murad Bey, whose official title was “Leader of the Pilgrimage to Mecca,” had his headquarters on the Giza Plateau, in the form of a castle at its northern edge (the pyramids stand near the plateau’s southern edge). Ibrahim Bey, whose title was “Chief of the Country,” stayed on the other side of the Nile in Cairo proper. As Napoleon’s army crawled closer and closer, moving up the west bank — that is to say, the Giza bank — of the Nile, the two beys’ forces remained split, one on each side of the river. It was disastrous positioning, reducing a potentially insurmountable numerical advantage over the French to one that was merely daunting. To this point in his career, Napoleon had defined himself as a military commander by his determination always to attack, attack, attack. Yet what he did now proved that, whatever else he might have been, he truly was a superbly flexible battlefield tactician. He formed his forces into tight defensive squares and let the Mamelukes come to him. This they obligingly did. They charged forward, their horses’ hooves thundering, scimitars twirling over their heads, screaming the battle cry that had struck terror into the hearts of the Crusaders. Few of the French soldiers — exhausted, hungry, thirsty, and in many cases sick — could have repressed a shiver at the terrible spectacle bearing down on them. The Mamelukes were indeed fearsome fighters. Any of them would have been more than the equal of any of the French soldiers one on one. But they weren’t fighting one on one, and that was the key. They had no idea how to mount a coordinated cavalry charge capable of breaking through these lines of downtrodden but disciplined, mostly veteran French soldiers. They were cut down by the thousands in what one French officer called “two hours of indescribable horror.” Total Mameluke casualties at this Battle of the Pyramids remain uncertain, but may have exceeded 10,000 dead. The French lost only about 25 men, far fewer than had succumbed to heat and deprivation on the long march from Alexandria. Having thus broken themselves against the French army, the remnants of Murad Bey’s forces, along with their leader, fled south. After witnessing the carnage from the other side of the Nile, Ibrahim Bey wanted no part of the French. He too fled south with his forces, taking with him as well the duly appointed Ottoman viceroy of Egypt (this position in reality was, as already noted, little more than ceremonial). With the enemy thus routed, Napoleon’s army was left only to clean up the carnage on the west side of the Nile and arrange to cross the river, which task was accomplished by hiring local boats. Napoleon himself rode into Cairo on July 24, establishing his headquarters in one of the city’s most opulent palaces. He was their new ruler, he informed the people. From now on, they would fare far better than they had under the Mamelukes, so long as they recognized his authority. For the most part, they did so. The group crossed the river by boat the next day, climbing up to the Giza Plateau at about noon. Denon found himself experiencing mixed feelings at the sight before him. The irony of the words he wrote about his impressions is rich, given the man he served. The gigantic pride which gave [the pyramids] birth appears more enormous even than their actual dimensions; and one hardly knows which is the most astonishing, the madness of tyrannical oppression, which dared to order the undertaking, or the stupid servility of obedience in the people who submitted to the labor. In short, the most favorable view, for the honor of human nature, in which these monuments can be considered is, that man was thereby ambitious of rivaling nature in immensity and eternity, and not without success, since the mountains contiguous to these edifices are less high, and less still exempted from the ravages of time than this work of human hands. Like John Greaves a century and a half before, these day trippers found the Pyramid of Khufu open to all, with a convenient bank of sand leading up to its entrance. Napoleon, who was more interested in the pyramids as symbols than as physical objects, refused to sully his uniform or his dignity by crawling down the passage unto which the entrance led. Denon and a number of the others, however, were less fussy. At the extremity of this gallery two large blocks of granite are met with, which form a second partition to this mysterious passage. This obstacle appears to have perplexed all those who have undertaken the research, and has led to several random attempts to surmount it. Endeavors have been made by former visitors to cut a passage through the solid stone, but this proving unsuccessful, they have returned some way, have passed round two blocks of stone, climbed over them, and thus discovered a second gallery. Did the descending passage continue beyond those two massive stone blocks? The question would become a burning one for one of the pyramid explorers of the next century. While Denon and others crawled through the interior of the Pyramid of Khufu, Napoleon proposed that those who remained outside race one another to its top — albeit once again exempting himself from participation. To everyone’s shock, the winner was the pudgy mathematician Gaspard Monge, who at 52 years was older even than Denon. He liked to say that the little flask of brandy he always carried at his belt, from which he was forever nipping, gave him extraordinary powers. Based on this performance, some began to believe him. Though its proportions are colossal, the outline is pure and graceful; the expression of the head is mild, gracious, and tranquil; the character is African; but the mouth, the lips of which are thick, has a softness and delicacy of execution truly admirable; it seems real life and flesh. Art must have been at a high pitch when this monument was executed; for, if the head wants what is called style, that is to say the straight and bold lines which give expression to the figures under which the Greeks have designated their deities, yet sufficient justice has been rendered to the fine simplicity and character of nature which is displayed in this figure. All told, the party spent only about two hours on the Giza Plateau, in what was to be the only visit there by Napoleon. Yet the symbolism of this encounter between these foremost monuments of the ancients and the man who sought to mold himself in the image of the great ancient conquerors — and would to a large extent succeed, however briefly — is rich. This even if said modern conqueror was a little disinterested in the whole affair. But our conqueror’s current dream of glory, that of becoming the next Alexander the Great, was looking more fraught than ever. Already on August 1, 1798 — some time before the aforedescribed day trip to the pyramids — Admiral Nelson had caught the French fleet which had delivered Napoleon’s army to Egypt at anchor in a bay outside of Alexandria. He proceeded to utterly destroy it. Meanwhile Foreign Minister Talleyrand for his own inscrutable reasons had not traveled to Constantinople to soothe the Turks, as he had promised Napoleon he would, even as his sanguine assurance that the Ottoman Empire would simply overlook France’s invasion of its sovereign territory was proving ill-founded. Instead the Turks were determined to drive the French out of Egypt, and were making common cause with the British to do it. While Ottoman divisions prepared for battle on land, the Royal Navy was blockading the Mediterranean to prevent reinforcements or supplies from reaching Napoleon’s army. The savants could do nothing about any of this, so they settled down to the work they had been recruited to do, establishing an Institute of Egypt in Cairo to serve as the locus of their investigations. They surveyed, measured, and cataloged the geography, the flora, the fauna. They charted the streets of Cairo and did their best, within their blinkered European frame of reference, to understand Islam and the other cultural conventions of the country they had invaded. They even made some halfhearted attempts at cultural outreach, although the gulf between their world and that of the Egyptians was so wide that most of them struggled to view the natives with anything other than contempt. Yet, much to their own surprise, the work for which they would be remembered most of all was something none of them had ever anticipated or trained for: the uncovering and documenting of countless monuments and artifacts of ancient Egypt, most of them totally unknown to Europeans before the arrival of the savants. Whatever their ostensible fields, they were all educated men accustomed to studying things in an intense but methodical way. They used these skills to essentially found the field of archaeology. Much of what they documented has since been destroyed, an ironic outcome of the savants’ own publications, which ignited a craze for ancient Egyptian booty back in Europe. But, regardless of the ironies which comes attached to it, the work they did is invaluable even today to Egyptologists. One of the most dedicated explorers and documenters of ancient Egypt proved to be Vivant Denon, whose dilettantish exterior masked a soul made of sterner stuff than anyone could have guessed. He marched the entire length of Egypt with the army units who were seeking to subdue the last of the Mamelukes and the ever-troublesome Bedouin nomads, sketching all of the wonders of the past he found: the smaller pyramids of the Saqqara and Dashur complexes, the ruins of Thebes, Karnak, Luxor, and so much more. When he returned to Cairo after some nine months in the desert in July of 1799, not a trace of the perfumed Parisian gentleman remained. With his unkempt hair, long beard, and ragged clothes, he looked more like a madman — or a prophet, Moses come out of the desert. But his artist’s sketchbook was full of things the other savants had never dreamed existed. They immediately dispatched more of their number southward. Yet it wasn’t Denon or any of the other savants who made the most famous single archaeological find of the trip. The same month that a disheveled Denon returned to Cairo, a group of French soldiers digging fortifications in the town of Rosetta uncovered a black basalt slab, four feet (1.2 meters) in height and weighing three quarters of a ton, with lettering carved into its face in three kinds of script: Egyptian hieroglyphs; another, later form of Egyptian writing known as Demotic; and Greek. The last was easy enough to read; it consisted of a ceremonial decree issued by King Ptolemy V in 196 BC, establishing his religious right to rule in Egypt. Although they hadn’t been the ones to discover it, the savants recognized the Rosetta Stone’s importance immediately. If, as seemed likely, the other scripts were a mere direct translation of the Greek, the mystery of Egyptian writing could soon be solved after centuries of fruitless attempts. As it happened, it wouldn’t be quite that simple. The Egyptian texts actually weren’t word-for-word translations of the Greek, and the hieroglyphs on the stone were significantly damaged. And of course even a perfect transcription of one message into hieroglyphs would still have left plenty of work to do in deciphering an entire written language. Not until 1822 would Jean-François Champollion — who was French but wasn’t among Napoleon’s savants, being eight years old at the time the Rosetta Stone was discovered — publish the first substantially correct explication of hieroglyphic writing. Amidst all these new discoveries, the pyramids remained there on the Giza Plateau, absurdly convenient to the savants in Cairo in comparison to all of the other sites of interest. Indeed, the pyramids seemed to many of them almost overly familiar — just a little dull — in comparison to all of the new wonders. Some of the savants, however, found these monuments in their backyard to be more than intriguing enough. The one of their number most taken with them was the young engineer Edme-François Jomard, who spent weeks on end on the Giza Plateau as soon as the security situation allowed for it. In some ways, he was the natural heir to John Greaves, equally obsessed with measuring and quantifying, but with advantages of equipment, time, and access which Greaves had lacked. In another way, though, he was more akin to Athanasius Kircher. Like the Jesuit polymath, he had read deeply in the ancient texts attributed to Hermes Trismegistus, and was eager to find a higher significance in his data. He makes for a fascinating character in pyramidology, an important formative figure in both of our own contemporary ways of thinking about the pyramids: as explicable constructions of an admittedly strange ancient culture, and as inexplicable manifestations of hidden spiritual or metaphysical truths. It was actually Jean-Marie-Joseph Coutelle — the engineer responsible for the hot-air balloon that traveled to Egypt as part of Napoleon’s entourage — and Jacques-Marie LePère — an engineer who also conducted a sweeping survey of much of northern Egypt, in the hope of finding a way to link the Red Sea to the Mediterranean — who were placed in charge of conducting the first careful, comprehensive survey of the Giza Plateau. But these senior savants had much else to do, and appear to have left most of the practical work to Jomard. For the first time, he attempted to document and measure everything on the plateau, including the three great pyramids, the apparent causeways and other scattered ruins, and the Sphinx. As usual, though, it was the Pyramid of Khufu — the largest structure on the Giza Plateau, and the only one that could be entered — which interested Jomard the most. He became obsessed with determining its true dimensions. This was a far more difficult question to answer than one might first assume; indeed, it’s not an entirely settled issue even today. The true size of the Pyramid of Khufu was literally, one might say, hard to get to the bottom of. The Giza Plateau had presumably been swept free of sand when the pyramid was built, but now it was covered with the stuff, all but burying the Sphinx, piling up in great drifts at the pyramid’s base. To this had been added the detritus of countless visitors over the millennia, as well as shards of the pyramid’s former outer casing, dropped by the workers who removed it, and more stone fragments which had fallen away or been kicked loose, accidentally or purposely, by the many people who had climbed it since. When Greaves had measured the pyramid at 693 feet (211 meters) on a side, he had been standing atop all this detritus. Jomard knew it had to be larger at its real base. The question was, how much larger? To find out, Jomard began what amounted to the first real archaeological excavation on the Giza Plateau. He hired a group of Egyptian workers for the enormous — and dangerous, what with the risk of landslide — task of digging out the area around the pyramid. It turned out to be a long, long way down to the bedrock of the plateau — about 50 feet (15 meters). Given this, a complete excavation was simply too immense a task. Yet he did learn from his limited digging that the pyramid was built upon what appeared to be a flat, level pavement, itself rising just above the level of the bedrock. By digging at the northeastern and northwestern corners of the pyramid, he was able to establish two points by which to measure the length of a side of the base. It proved to be 745.6 feet (227.25 meters) — almost exactly halfway between Herodotus’s figure of 800 feet (244 meters) and Greaves’s of 693 feet (211 meters). Greaves had calculated that the vertical height of the pyramid must be 499 feet (152 meters), based on an assumption that each face of the pyramid was a perfect equilateral triangle. By measuring the angle of inclination of the faces, however, Jomard determined that this assumption didn’t hold. Each face was actually an isosceles triangle, with its base considerably longer than its other two sides. He calculated that the pyramid’s vertical height must be 470 feet (143 meters), if it had come to a point at the top rather than being truncated into a flat platform; Jomard assumed that the platform had not been a part of the original construction. The inventor Nicolas Contê, another of the savants, had recently devised an altimeter, which measured height through atmospheric pressure. His instrument read 428 feet (130.5 meters) on the platform at the top of the pyramid, which dovetailed fairly well with Jomard’s calculations. Still, none of these numbers clarified for certain how tall the pyramid had been at the time of its construction. There remained the issue of the long-gone outer casing. How thick had it been? As it happened, Jomard’s excavations at the northeastern and northwestern corners had revealed something that seemed to bear on just that question. In the bedrock just beyond the pavement on which the pyramid rested had been cut two shallow rectangular depressions, with two of the sides running parallel to the sides of the pyramid. 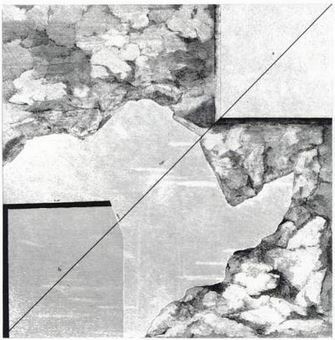 Jomard discovered to his astonishment that a line drawn from the apex of the pyramid down its lateral edge and through one of the depressions would point exactly northeast or northwest. The pyramid as a whole, in other words, was perfectly aligned to the cardinal points of the compass. Jomard and his colleagues assumed the depressions must be there to anchor the keystones of the pavement in place; the pavement must once have extended beyond its current dimensions. Presumably its corner edges marked the farthest extension of the pyramid proper when the outer casing was still intact. Measuring from the outer edge of one depression to the outer edge of the other yielded 763.6 feet (232.8 meters). If this was the true length of the pyramid’s base, with casing intact, then the original height might have been 477 feet (145 meters) rather than 470 feet (143 meters). Such modest differences might seem of less than earth-shaking importance, but at this point Jomard’s inclination to find meaning in these monuments of the ancients took over. His latest calculations had brought him tantalizingly close to something that seemed like it had to have meaning: a ratio between the length of one of the pyramid’s sides at its base and its apothem, or distance up one side to its apex, of five to four. He need only slightly adjust the size of the base — by starting to measure it roughly in the middle of the corner depressions instead of their far edges — to make a perfect fit. This seemed a reasonable adjustment to make. After all, why should the pyramid proper extend right to the very edge of the pavement even at the corners? Using his new numbers, along with extensive readings in the ancient Greek and Latin texts — particularly Herodotus, always the favorite of pyramid scholars — and a healthy amount of outright speculation, Jomard concluded that the Pyramid of Khufu was, in addition to or even instead of its function as a tomb, a sort of Board of Standard Measures for ancient Egypt. The length of the apothem, he said, was one Egyptian stadion, a standard measure of length mentioned by Herodotus. The largest common divisor between the apothem and a side of the base, meanwhile, was one side of an Egyptian aroura, a standard measure of area. (The base of the pyramid, in other words, was exactly 25 arouras in size.) 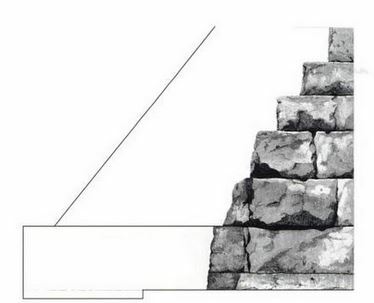 Jomard even proposed that the empty sarcophagus inside the pyramid might not be a sarcophagus at all, but rather a record of some standard measure of volume. All of this was so supremely tempting not least in that it stood to remedy one of the most frustrating problems of classical scholarship, then as now. The systems of measure used in ancient times, which show up all over the ancient texts, were (and remain) imperfectly understood at best. But if Jomard was correct, he could deduce the Egyptian units through his recent measurements of the Pyramid of Khufu. And with that data in hand, he could go back to Herodotus, who described the Egyptian measurements in terms of the Greek, to deduce the latter standards. In later years he would write a paper of more than 300 pages, floridly entitled “Memoir on the System of Measures of the Ancient Egyptians, Containing Research Concerning their Geometric Knowledge, as Well as on the Measures of Other Peoples,” to explain his theories. More recent research indicates that there was no factual basis to any of it. Jomard’s almost desperate determination to find meaning in the Pyramid of Khufu was a product of its sheer, infuriating inscrutability. The other ruins that the savants explored were for the most part covered with hieroglyphs, as were the obelisks and other artifacts that had been brought into Europe during the time of the Roman Empire. That was infuriating in its own way, given that no one could read the hieroglyphic writing, but it at least held out the prospect of an eventual understanding, if the right combination of deciphering genius and evidence should ever come along. The pyramids on the Giza Plateau, however, offered up only blank stone for inspection. Even the single set of markings John Greaves had described inside the Pyramid of Khufu had never been noticed since; they had presumably been mere discoloration or dirt. What kind of civilization had the knowledge of mathematics and construction needed to build the pyramids and align them so perfectly and yet lacked literacy? When faced with the incomprehensible, the human mind will search for meaning, will invent it if necessary. This tendency led Edme-François Jomard to become the inadvertent father of pyramidal numerology, a thriving discipline to this day. By the time Jomard was making the precise measurements on the Giza Plateau that would lead him to such dubious conclusions, Napoleon’s dream of an eastern empire had long since expired. Early in 1799, he had led most of his soldiers northeast into Syria, determined to begin making his way to India. But the Ottoman forces who opposed him there were far more effective than the Mamelukes. His advance was halted at the city of Acre, and he was forced to return to Cairo, having suffered the first real defeat of his military career. In August of 1799, he abandoned the army in Egypt and returned to France to try his luck there. Instead of becoming the modern Alexander the Great, he decided, he’d emulate the other most famous conqueror of ancient times: Julius Caesar. He overthrew the Directory to become the de facto dictator of France in November. Five years later, he was indeed crowned emperor. The army he left behind in Egypt remained there — what choice had it? — while the savants continued their work. Finally, a British expeditionary force arrived to drive them all out of Egypt. Cairo fell in June of 1801. The British confiscated most of the physical treasures the savants had gathered, including the Rosetta Stone; it wound up in the British Museum, where it remains today. But the savants carried the intellectual fruits of their sojourn back with them to France in their heads and in their journals when they were repatriated. They had paid a heavy price for the knowledge they had gained; 26 of them died in Egypt of one cause or another, and five more had their health so badly damaged that they died soon after returning to France. For the rest of their lives, those who had survived referred to themselves as “the Egyptians,” members of an exclusive club, forever bonded by the experiences they had had and the hardships they had suffered over their three years in the desert. Vivant Denon, predictably enough, landed on his feet back in Parisian society, exchanging his traveler’s rags for perfume and wigs just as easily as he had done the opposite. In 1802, he published Travels in Upper and Lower Egypt, which became a bestseller across the Western world. He became a veritable household name in his native country, where his sketches and descriptions of the sensual pleasures of the modern Egyptian harems were received with the same avidity as those of the splendors of the ancients. By now a great favorite of Napoleon (whatever had happened between him and Josephine), Denon soon became the first director of France’s new national museum, the Louvre. When he wasn’t busy with that, he traveled with Napoleon’s armies, and was as fearless as ever in sketching scenes from the Battle of Austerlitz and many others. Napoleon, wishing to shed the pre-revolution fleur-de-lis as France’s national symbol, asked Denon to come up with something else in time for his coronation as emperor. He produced a sacred bee, copied from the wall of one of the ancient temples he had explored. He died in 1825 at age 78. Edme-François Jomard, one of the less notable of the savants before Napoleon’s fleet set sail, became the elder statesman of the French Egyptians in the aftermath. In addition to contributing copious amounts of his own material, he became the editor of The Description of Egypt, 24 enormous volumes compiling all of the knowledge the savants had brought back with them, divided into three broad categories: antiquities, modern society, and natural history. “No other country has been subjected to researches so extended and so varied,” wrote Joseph Fourier in the introduction. Easily the most ambitious publishing venture in history to that point, it took more than 25 years to complete, yet was so expensive to produce that only about 1000 copies were printed. As one of the youngest savants to set out from France, Jomard was the last of them to die, at age 85 in 1862. To the end, he refused to accept Jean-François Champollion’s deciphering of hieroglyphic script into just another language like any other, insisting that it had to represent a higher, more spiritual form of communication. Did you enjoy this article? Please think about supporting the creation of more like it by becoming a Patreon supporter! 13 Comments for "Chapter 3: The Soldiers and the Savants"
I’m really enjoying these. Glad you started them. Regarding Napoleon’s thorny questions to his savants: Stanley Kubrick was fascinated by Napoleon and tried to make a film about him. And while making 2001: A Space Odyssey he used to ask the actors to state their thoughts about aliens and life and such each morning before filming commenced. I’m wondering now if he got the idea from Napoleon! I didn’t know that about Kubrick. Interesting. “determined to make begin making” is a typo. Wow. Really loving your writing here. Your history is pretty damn addictive! Reminds me a bit of Tuchman. Can’t wait for the next installment! Wow… that’s one of the nicest things anyone’s ever said to me. The Guns of August is one of my models for great narrative history. Small note, Hermes Trigmegistus should be Trismegistus. Enjoying this immensely by the way. I’ve heard conflicting theories/histories of the Sphinx and Napoleon’s soldiers – I’m surprised there’s no mention of this here. Is this because there’s no veracity to them? This is the old tale of Napoleon’s soldiers being ‘bored’ and shooting a cannonball at the Sphinx, thereby knocking off its nose. I find myself dubious of this theory, given the description above of the relative locations of the soldiers and the Sphinx… but I’d love to have it given some investigation. Still, a wonderful article and a fine addition to the historical writings started in The Digital Antiquarian, thank you very much. An Egyptian leader a couple of hundred years before Napoleon’s army arrived apparently did order the Sphinx desecrated as a heathen monument. This would appear to be the source of the damage that is sometimes attributed to the French. I have a chapter coming on early excavations of the Sphinx, which will address some of this in more detail. On the subject of Napoleon’s height, there is a lot of conflict, especially due to British propaganda. However, there appears to be a fair bit of evidence that Napoleon was not short, and perhaps on the taller side for his time. It seems that a great deal of this conflict centers around his valet Louis Joseph Marchand and surgeon François Carlo Antommarchi measurements of him at death of five feet, two inches, and whether that is in English or French inches (French inches were 2.7 cm compared to the English 2.54 cm). I read the argument that since Napoleon had worked on switching France to the metric system for over 20 years, that it would be unlikely that he had a French yardstick. However, in “The Life of Napoleon Bonaparte, Emperor of the French” (1827) by Sir Walter Scott, he describes Napoleon as being “five feet six inches English.” In “The Life of Napoleon Bonaparte” (1856) by Phineas Camp Headley, it states: ‘The following note from the papers of the War Department, shows the rank and prospects of the Corsican upon his entrance into the Parisian Academy: “State of the king’s scholars eligible to enter into service, or to pass to the school at Paris: Monsieur do Bonaparte (Napoleon), born 15th August, 1769; in height five feet six and a half inches.” Another English source, Andrew Darling, an English upholsterer who made the arrangement for his funeral, put him at 5 feet, 7 inches. Supposedly, in the memoirs of Denis Davidov, he describes Napoleon as being 5 feet, 6 inches. I hardly expect this to end the debate, but I find the evidence of him being a taller man more compelling. Different sources give Napoleon’s height as anything between five foot two and five foot eight. At this time, the average height of a Frenchman was five foot six; many contemporaries made reference to Napoleon’s short stature and several were unsympathetic towards him, such as his second-in-command on the Egyptian expedition, General Kléber, who used to refer to him privately as “that Corsican runt.” I have favored this lower figure for Napoleon’s height as it seems more likely given these circumstances. Strathern, Paul. Napoleon in Egypt . Random House Publishing Group. Kindle Edition. As an aside, Joseph Fourier is better known for his works in mathematics and physics, with the Fourier series, Fourier transform, and Fourier’s Law being named in his honor. Track my comment status and remember my identity using cookies. All writings on this site except reader comments are copyright Jimmy Maher. All rights reserved.